This Mother's photo necklace makes a personalized, cherished gift for Mom. 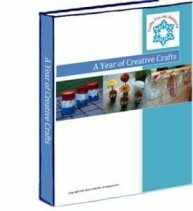 This craft project is fast and easy. 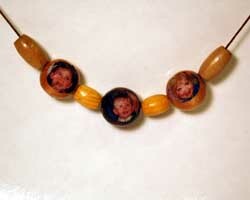 Photos of the children are decoupaged on to wooden beads. There are many variations to make the necklace. 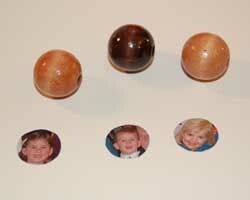 I mainly explain how to decoupage on the photos on to wooden beads, but the creativity on making the necklace is up to you. You could add on any type of bead you choose to make a really unique necklace. Or, make this into a bracelet! 1. 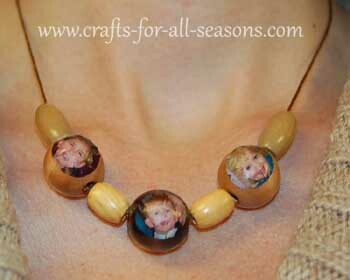 Begin your Mother's photo necklace by reducing the size of your child's photos to fit on the beads you are using. You can use photo software to do this. If possible, also use the crop function in the shape of a circle. You may need to print a few test copies to play around with the correct size. If you do not have photo editing software, you can always crop the picture out yourself with scissors, and reduce the photo using the printer settings. Print the pictures out on regular printer paper, not photo paper. Photo paper tends to be too thick for decoupage, and you will get a nicer result with thin printer paper. Just make sure to set your printer to the heaviest ink volume and "best" quality to get the best looking picture. 2. Cut out each tiny photo. Apply some decoupage medium to the surface of the bead using a paintbrush. Then, apply the photo to the bead, pressing down the edges well. 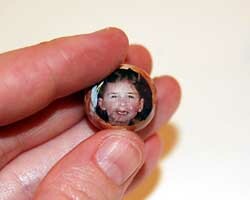 Then, follow up with a coat of decoupage medium on top of the photo and the rest of the bead. Allow to dry. 3. Now you can thread on your beads to the necklace cord, adding on any additional beads you choose. Use your creativity! Add a jewelry fastener of choice and your necklace is complete.